David Zimmel, CEO, Zimmel Associates, executed the sale of 1400 State Route 35, Units A, B and C, Ocean Township, NJ. 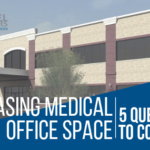 The buyer, AEI Holdings, an Orthopedic Group based in Ocean Township, contacted David Zimmel to locate a site for a new Orthopedic Medical Office Building. There were three individual condos adjacent to each, with three separate owners. However, David Zimmel anticipated that all three condos together would perfectly fit the bill. He then went to each owner independently, secured signed contracts and arranged to close all three on the same day. Additionally, due to his outstanding presence in Monmouth County and stellar reputation, David Zimmel was awarded exclusive broker for a property right down the road, located at 807 State Route 35, Ocean, NJ. The 15,300 sq. ft. building on 2.7 acres is zoned retail and presently used as a luxury automotive dealership. It is currently available for sale or lease. For more information, please contact David Zimmel.